Brothers, Corey and Cameron, love to fish together! 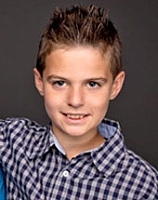 Corey is a bright young boy who enjoys both indoor and outdoor activities. He is a great ‘fixer’ and is quite adept at fixing electronics. Corey enjoys playing on his iPod or computer as well as playing outside and fishing with his brother. Younger brother, Cameron, has a good sense of humor and can easily make others laugh. Cameron is fond of cats and enjoys playing with them. When asked what he wants to be when he grows up Cameron jokingly replied, “A babysitter for cats.” Cameron also enjoys playing on his pogo stick and iPod, nerf guns, and is quite the skilled fisherman. Corey and Cameron respond best when they have a well-structured home and school environments, consistency in their daily routine, clear expectations and limits, and logical consequences. They would likely be most successful in a family that can provide them with the attention and support that would benefit them most.